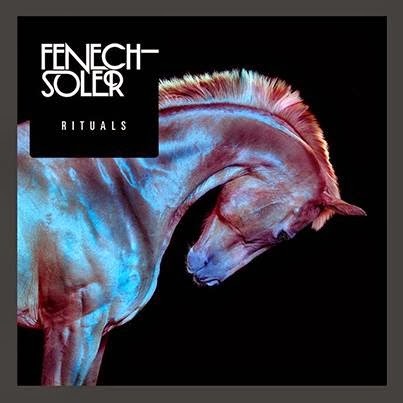 It's quite shameful really that 'Rituals' is my first encounter with Northamptonshire's Fenech-Soler having been active since 2006 and this being their sophomore album but as they say I guess it's better late than never. As we're welcomed in with glistening arpeggiated synths on Youth the band make it crystal clear from the opening what they're all about. Their blend of inoffensive Synth-Pop is sure to be a hit amongst many as their sunshine vibes allow us to cling on to the last days of summer as we bask in the unexpected September warmth. Deeply rooted within the Indie-Dance scene Fenech-Soler manage to forge a blissful cross section between the two genres. Eagle eyed listeners will have already picked up on this through popular track All I Know along with the singles Magnetic and Last Forever. It's this care free danceable aesthetic that runs through the heart of their music creating some incredibly infectious melodies demonstrated beautifully on In Our Blood with big hitting drums pulsating through the euphoric synths leaving you enraptured with glee. The albums midway point sees a slight change in sound with Somebody through its club-esque slinky basslines and switch up in percussive style. A welcomed reminder that the band go far beyond simple arpeggiated synths and excel all prejudgemental pop sensibilities. The same can be said for Fading too with a much greater maturity giving it a richer sophistication. It's a shame though that Maiyu uses pretty much the exact same drums as Somebody resulting in a slightly repetitive feel for the album. It does have a different synth pattern with a nice break down towards the end but I can't help but feel things start to get a bit samey same. Two Cities goes some way to bringing things back to life returning to their moulded sound with moving atmospheric moments as the track builds beneath the layers of electronic goodness, but is this too late for redemption? As it fades out in to the second and final interlude, Ritual II, we become greeted by the albums closing track Glow. Rising through glassy synths and wistful vocals comes skippy guitars and a wholesome dance feel as the band do everything they can to make sure they go out with a bang. It's a song that could have so easily soundtracked your summer had the album been released before festival season, but maybe it can add some fire to your Autumn. All in all 'Rituals' proves to be as fun as ever with plenty to keep music listeners occupied however its repetitive nature seems to be a fairly large drawback. Granted you can't reinvent the wheel but using the same few chords and drum patterns throughout isn't going to win over many new fans. But then again, who cares when all you can't help but do is dance. 'Rituals' is available to buy now.